I won't go into too much detail about this (because I'm not sure I'm allowed and I don't want to get sued!) but I nominated my mum because I felt she deserved a treat after spending so much of her life dedicated to helping Myles with his football career. Me & Myles got together, filmed a cute little video about why she deserved a treat, and sent off an application form. A week later, I got an email looking for special mums, so I replied to that, attaching the video and explaining I'd already sent an application in. After that, everything happened so fast! I replied to the email on Wednesday, got the phone call from ITV on Thursday, and was kind of confirmed on Friday for the following day's show. I say 'kind of' confirmed because it was never actually 100% said 'yes, your mum has been chosen for a surprise'. Even when we took our seats, we weren't sure if we'd actually been picked. I couldn't relax until the moment I heard Ant shout her name. The rest of the show passed in a bit of a blur- I couldn't quite believe this had actually happened! It was even harder to believe when, just three weeks later, we were at the airport getting ready to board that special chartered flight. Dec had already flown out the day before us so he wasn't on our flight, but we did get to hang out with Scarlett Moffatt and Stephen Mulhern for a bit (When I say 'hang out', I mean 'they took photos in front of us and I elbowed children out of the way to be in shot'). Can you spot me in the photo below? We stayed at Loews Sapphire Falls Resort at Universal Orlando, which is the newest of the Universal hotels. I'd never stayed at Universal before, and would never have considered it, but the hotel was absolutely wonderful! The room was lovely, with big comfy beds and a gorgeous view over the lake where we could see the water taxis drifting back and forth. These water taxis got us to the parks in just six minutes, so it was super convenient, and sometimes they played banging karaoke tunes. I did try walking it one day but I got a bit lost and it took about 25 minutes, so I never did that again! It was a bit of a surreal experience walking around the hotel and parks seeing all these people who you'd seen on the show. Very odd going 'oh look, there's Mason and his mum' when you'd never actually spoken to them in your life. We frequently bumped into Amanda, whose son in the forces flew back to surprise her, and spent a lot of time with Terry and Diego, who missed their honeymoon when Terry fell into a coma. They were both the most hilarious guys, and we shared a float with them for the Mardis Gras parade, which was one of the highlights of the trip. So much fun dancing on top of an elaborate float, being driven through the streets of Universal Studios and flinging beads at people lining the streets. The parade took about 45 minutes but it felt like it was over in seconds. We got so completely swept up in the music and the whole excitement of it. I definitely think we had the most fun float, with Shekeira and her lovely girls who absolutely cracked me up ("Mum! When I was throwing my beads, I hit one lady right in the FACE!") Of course, everybody was just so happy to be there and because the winners tend to be quite big characters, everyone was super friendly and chatty. As part of our prize package, we also got tickets to the Blue Man Group, but we weren't quite so enamoured with that. It was very... odd. I like odd things but this was not the type of weird I appreciate. It just made me feel a little uncomfortable and creeped out. I don't think I can even adequately describe what we saw because it was one of those true 'what did we just watch???' moments. Still, it was definitely an experience and I can't complain about that! Of course, on the Saturday it was time for the season finale of Saturday Night Takeaway. It was obviously different to how I'd imagined it, what with it being Dec on his own, but it was still an incredible experience. We were all a bit worried about the weather since the show was held outside at 2pm- would it be really sunny and crazy hot? Will we be struck by one of Florida's typical afternoon storms? The producers were prepared for both eventualities, dishing out ample bottles of water and plastic ponchos. Thankfully, we got lucky with the most perfect conditions. Seconds before we went live, it started to rain but after just a few drops had fallen, it stopped and instead we were left with a breezy, largely cloudy afternoon. Absolutely ideal! There's a lot of standing up, sitting down, dancing and cheering required, so we were very pleased to find it wasn't too hot! My third (!) experience being in the audience of Saturday Night Takeaway was by far the best. I mean, I was in Florida, so it was always going to be exciting, but it just felt so thrilling to be there for the final, boogying to Craig David and the Rembrandts, and I finally got my face on the TV! Woohoo! It was such an amazing week that I can't fully express it. 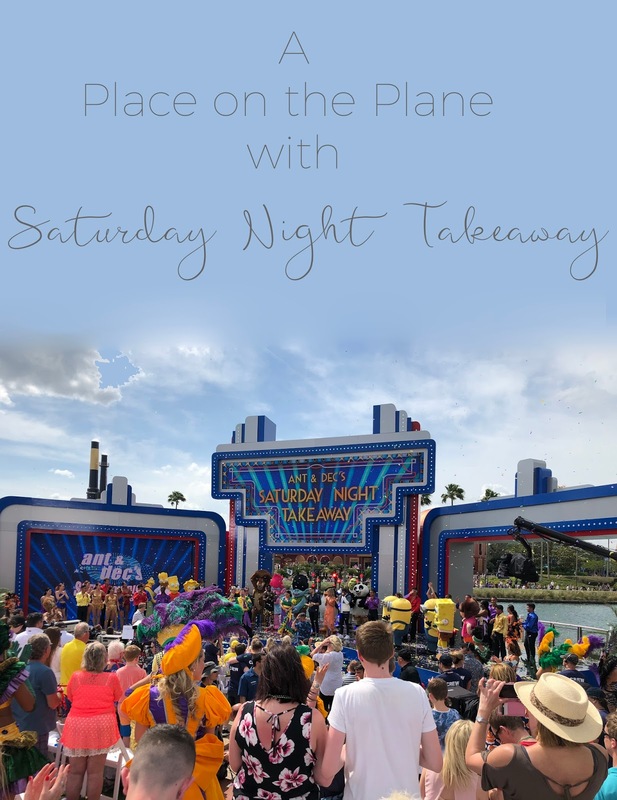 A huge thank you to everyone at ITV and Saturday Night Takeaway for making this possible, to Virgin Holidays and Universal Studios for an incredible prize package and, of course, to my very lovely and deserving mum for choosing to take me with her. I'm sorry for all the snoring! I loved following your tweets in Florida - looks like you had the most amazing time! I was watching looking out for your face the whole show hah! I really enjoyed reading this and I'm glad that you had an amazing time. Loved reading this. We won a place on the plane for my son Caleb (the one in the wheelchair!!) We literally had the holiday of a lifetime so reading this brought back special memories! Glad you and your mum had such a nice time. We remember you! 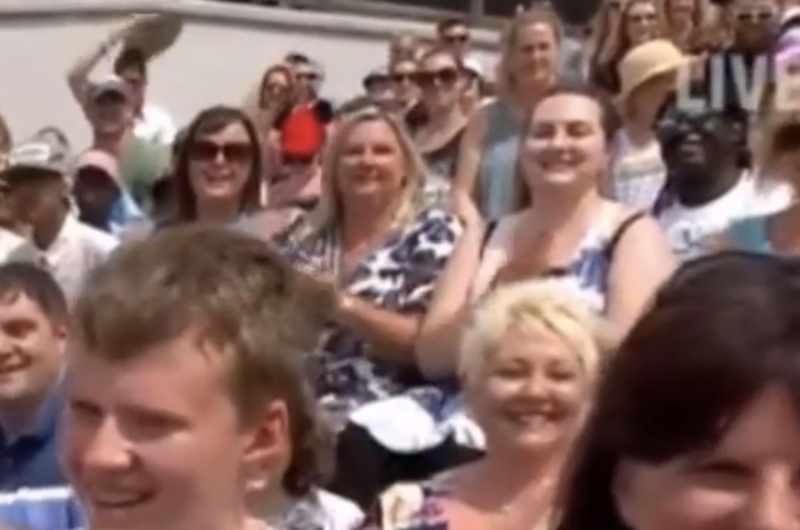 So funny how it feels like we know people even though we never spoke to them, just because we remember them on TV and saw them out & about in the parks!